Some of the drills he loves to teach and practice the most are the same ones he learned when he was three or four years old. The key is getting the participants to connect the drills and concepts with their daily habits, and Zane has a gift of breaking down technique into easily understandable components for swimmers of all ages. He believes in solid technique and good communication with coaches. Zane explains “I’m more of a quiet kind of person, so if I ever had a problem I’d try to sort it out myself or work through it.” He wants to mentor swimmers to help them understand how important it is to learn how to ask for the help they need. Zane Grothe’s Nevada roots led him to be involved in swimming from an early age. The town he was born and raised in, Boulder City, is right on Lake Mead and his parents had a boat. With Zane and his little sister toddling around the water, Zane’s mother was adamant that they be enrolled in water safety classes at the local pool. 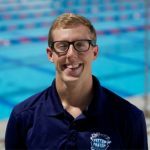 After taking lessons for several years, Zane joined the Boulder City Henderson Swim Team at three years old. Zane swam for the Boulder City Henderson Swim Team from ages 3-18 where he experienced a lot of success as an age group swimmer. It helped that he got started so young, but he had a lot of talent, especially in distance events. 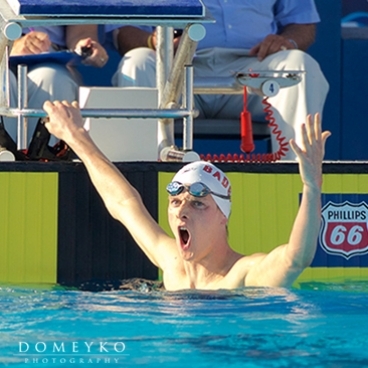 He achieved a high national ranking of second in the 500 free when he was 12 years old. After a difficult senior year under a new coach at Auburn, Zane went pro and moved to train with the Florida State University team. It was a tough transition, and none of his taper meets had the times he wanted. “They just got slower and slower. I was ready to quit, but I just decided to give it one more try with a different program.” His efforts paid off. Zane moved to Indiana University and increased his yardage by 40%. He subsequently had the best performances of his career at Nationals, placing 1st in the 400 and 2nd in the 200 free. Zane’s in-depth experience with phases of training at each developmental level will give your kids the most relevant stroke technique tips. He is excited to work with athletes of all ages with the Fitter and Faster Swim Tour!